• WELCOME TO MY SAFE HOME, TO MY SHELTERED HAVEN. This is a wining sculpture that serves as a milestone in the Gateway of Nelson City. In a wonderful landscape, the orientation of the sculpture is designed for maximum use of light and obtain shadows. • The local Maori comunity have been involved throughout the process, installation of this sculpture took a sacred dimension. Various rituals were performed in several stages of the process. 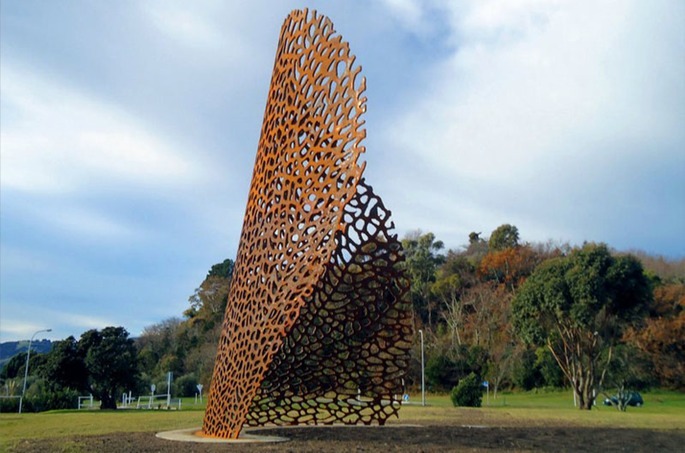 • The sculpture was made partly in Spain and sent by ship to NZ where was finished to assemble and install. In the process very actively involved landscape engineers of City Hall.